Rather than include transit and walking directions natively in the new Maps application in iOS 6, Apple will instead highlight third-party options available on the iOS App Store. The ability of third-party developers to create transit apps for iOS 6 was highlighted by Apple's iOS software chief Scott Forstall at Monday's Worldwide Developers Conference keynote. 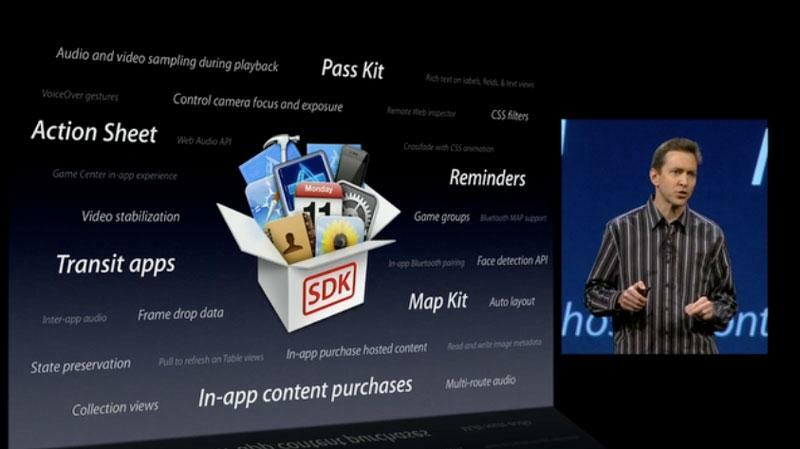 He noted that a new application programming interface for transit apps to interface with Maps is a part of iOS 6. "When building Maps, we looked around and realized the best transit apps for metros, for hiking, for biking, are coming from our developers," Forstall told developers. "And so instead of trying to develop those ourselves, we are going to integrate and feature and promote your apps for transit right within the Maps app in iOS 6." No further details on exactly how third-party applications will be discovered or promoted within iOS 6 Maps were provided. But release notes accompanying the first developer beta of iOS 6 describe how apps without their own map support have an easier way to launch the Maps application and display directions or points of interest. "Apps that offer routing information, such as turn-by-turn navigation services, can now register as a routing app and make those services available to the entire system," the release notes explain. "Registering as a routing app gives you more opportunities to get your app in front of users. Routing apps are not limited to just driving or walking directions. Routing apps can also include apps that provide directions for the user's favorite bicycle or hiking trail, for air routes, and for subway or other public transportation lines." It goes on to say that Maps "knows about routing apps in the App Store," and will provide users with the option to download those applications for directions even if they are not already installed on that particular device. The new APIs for routing and transit apps are a change from previous builds of iOS, which feature Google Maps data and services. Google's mapping solution features its own built-in directions for public transportation, biking, hiking and more.